It's takes alot of time to get an iguana to trust you, especially a young one. Some iguanas are more aggressive than others. 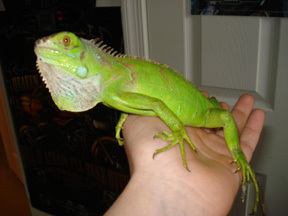 I named my iguana Lucifer because of how nasty he is. He bites, claws, hisses, and tail whips. I have just recently accomplished taking him out of his cage without him tail whipping. Just remember to be patient. It takes time.